paika Well Sleazes don´t mind, as long they can eat lol. esmeralda Very true they kiss like 5 year olds in the game lol. Should i add something else on the table? Like uh toiletpaper or what about a plunger LMAO? paika You have no idea, how much i laughed about your message just now. You are right, Teddy had too much Tampax today. He freaked out, bad side effect! 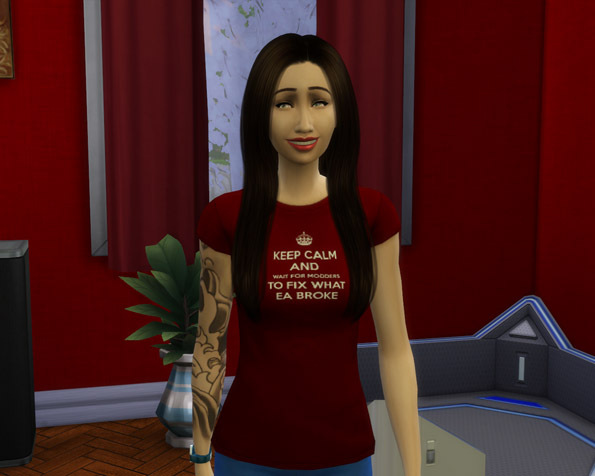 juliej Thank you, i might start with my first Sims 4 tale in 1-2 weeks? 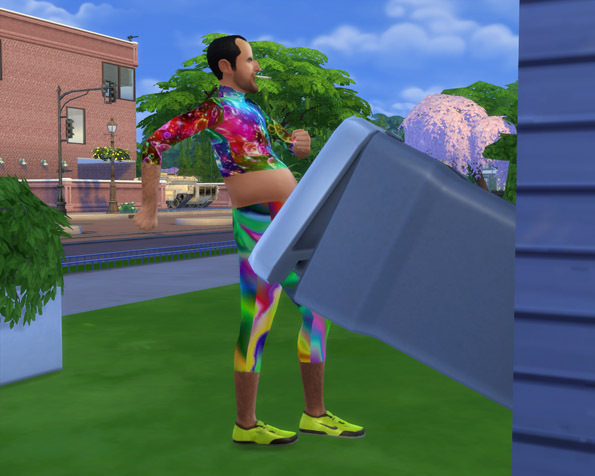 Ohhh, kicking the trash can is so much fun! 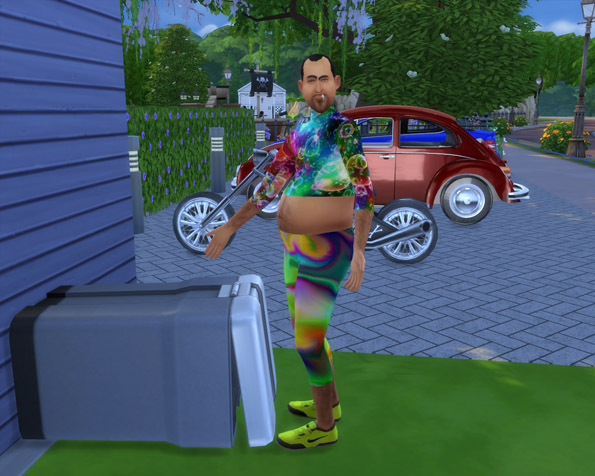 One time I had one of my sims just randomly kicking some trash can in the neighborhood. Kick it, pick it up, repeat. I found it hilarious how mu garbage started piling on the curb. 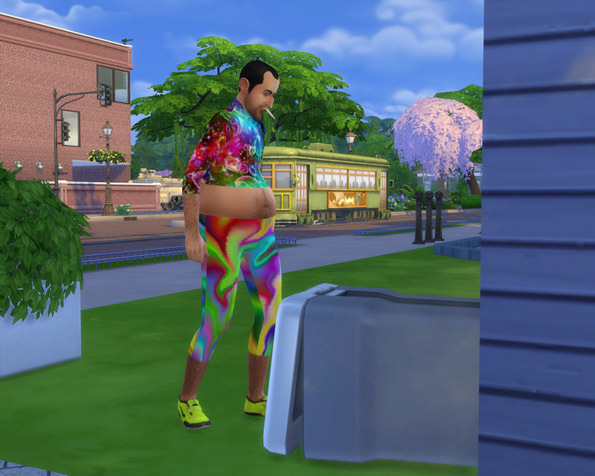 THEN SOMEONE COMES OUT OF THE HOUSE AND APPROACHES MY SIM! I thought: Uh, oh, here comes a lecture or some other punishment. But no! The home owner came up to the trash piles and started playing in the trash cheerfully. That was so absurd, it was one of the funniest things that happened in my game. Seriously, who would come out to a dirty lawn and start skipping around in garbage, possibly yelling "Yay, my garbage, you found my garbage!" as if someone hid it from her in that bin and she'd been looking for it all day...? paika No way lol truly a very unusual reaction. You remember which neighbor it was? 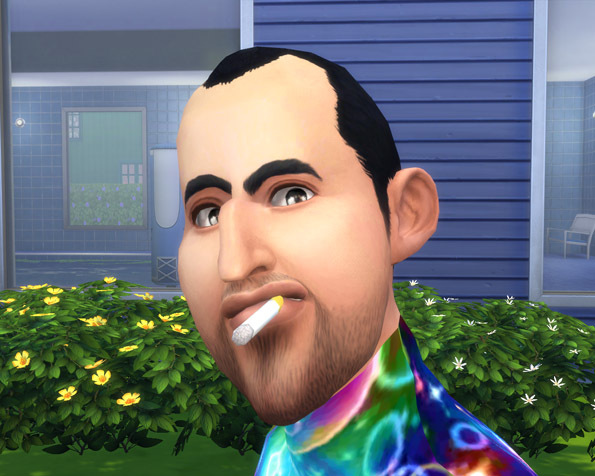 Must be a rubbish sim, with a playful character feature? It never happened to me before. Yes try that in real life, and you make a lot of new "friends" lol. All i see in the game, are Ufos at night. But the Aliens never kicked my trashcan away. Isn´t there any "go away Ufo" hack available? I don't understand. An average looking person. A normal looking shirt. A regular tattoo. No horns, no crooked anatomy, no colors. What game is this screenshot from? 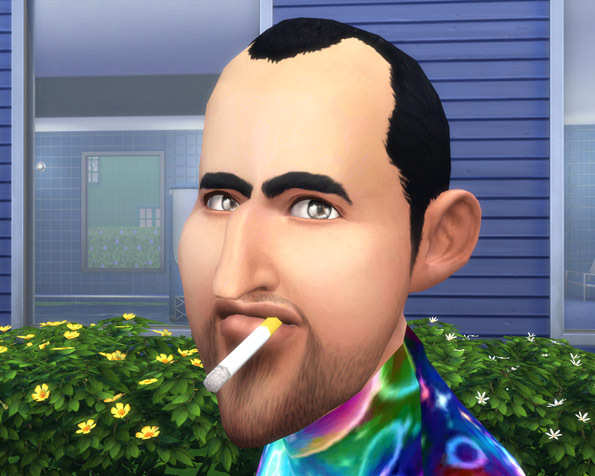 As for the trash loving sims, it's actually kind of common in my neighborhoods. 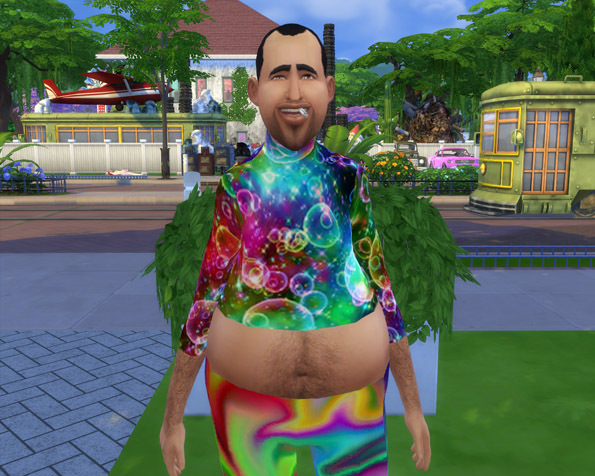 If you rummage through the trash in a park and create a pile of garbage, sooner or later some sim will come to play with it. It's pretty funny. juliej Thank you very much. Here are some family snapSHITS. Hieronymus Sleaze and his son Teddy, the man they call him the guy.....the stuff something dude? Griselda Tampaxx and her daughter Aurora. Their hobby is uh......cake and too much uhm make up. Stinky Sleaze (Teddys cousin), and his girlfriend Mikka Borecore. She likes cotton candy and he uh was in the army..............once. 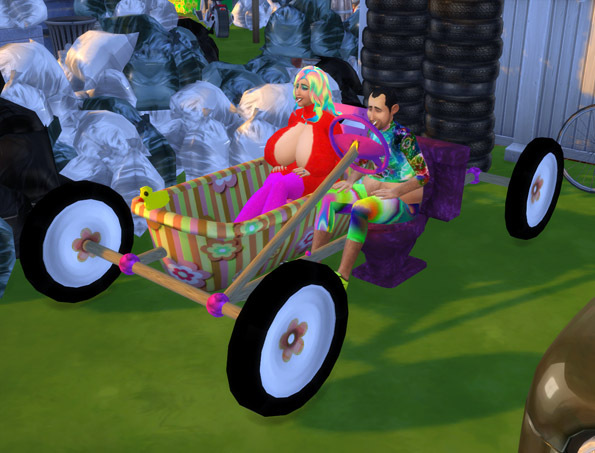 Nice to see Teddy and Aurora back in the Bathroomobile again, it really suits them! (Now if only we could actually drive cars, on the roads...) And the rest of the family is adorable too! Hey, it took me hours to handcraft that carved rubber duckie (see original here: www.modthesims.info/download.php?t=498696 )! LOL. I think I might have downloaded this vehicle back in Sims 2 days. I know it made me laugh, but I'm not sure I ever had proper "buyers" in game. 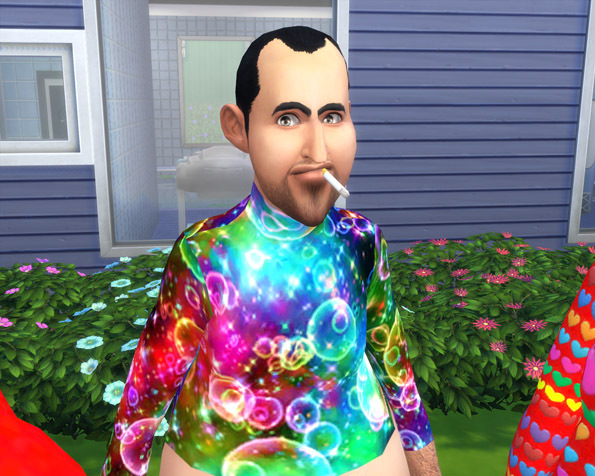 I only started making weird sims in TS3, because homelessness usually led my sims to inventing skill - lots of rummaging through neighbors' trash would get you tons of scrap. This car could have been one of the inventions, it'd totally fit in with them. I wish rummaging was the same in TS4, but sadly I haven't found any 9500$ VR goggles sets in anyone's garbage. Or huge space rocks. But I'm glad I don't find any teddy bears in the trash anymore. I had a whole collection of rescued teddy bears, always pretended to wash and recolored them, so they didn't all look the same.